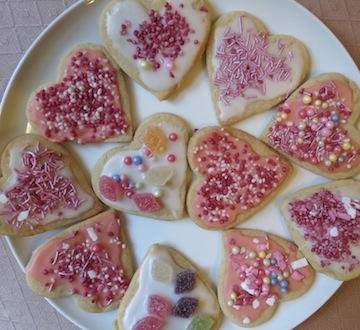 Looking for Valentine Recipes for Kids? 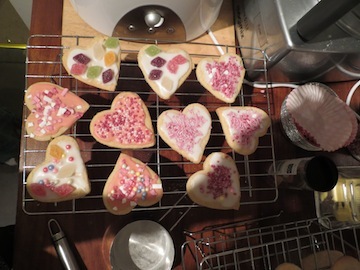 There is nothing sweeter than heart-shaped sugar cookies in the house around Valentines Day. 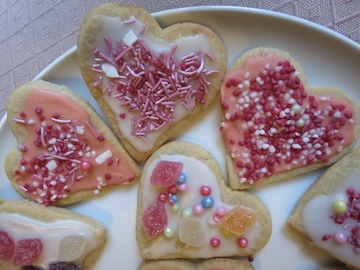 These cookies are one of our favourite homemade valentine ideas. They are super easy to make and are therefore great fun for small kids to shape and decorate! TIP: The recipe below makes about 20 cookies. Also, if you are making these with young children it might be best to make the cookie dough in advance and get them to help roll it out, cut it and decorate it. This is the recipe I use for all our holiday biscuits and comes from my favourite Hummingbird Bakery Book! 2. Put the butter, sugar and vanilla into an electric mixer and cream until light and fluffy. 3. Scrape the edges of the bowl, add the egg and mix in well. 4. Add the flour and salt and mix well (but don't overmix). Bring the dough together with your hands. 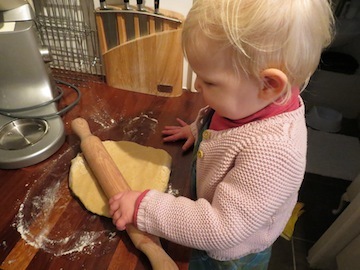 At this point your younger kids can get involved if they are too young to actually make the dough. 5. Dust a surface with flour and roll out the dough with a rolling pin. 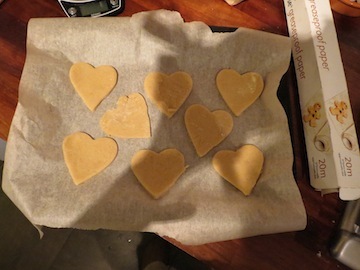 Take your heart cookie cutter and cut out your shapes. 6. Arrange them on the lined baking trays and bake in the oven for 10 minutes. 7. Let them cool a bit on the trays before transferring them to wire racks. 8. Mix up you icing sugar and water and use the back of a spoon to smear some icing onto your cooled cookies. While the icing is still wet cover with sprinkles or other candy. 9. Let the icing dry on the cookies and store them in an airtight container and bring them out to decorate the table....Aren't they lovely! 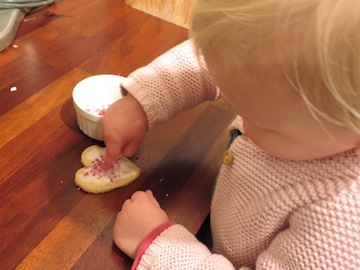 We will be adding more valentine recipes for kids so keep checking back here!